・ Hoffmann, Sebastian, Stefan Evert, Nicholas Smith, David Lee, and Ylva Berglund Prytz. Corpus Linguistics with BNCweb : A Practical Guide. Frankfurt am Main: Peter Lang, 2008. * Software, Tools, Frequency Lists, etc. 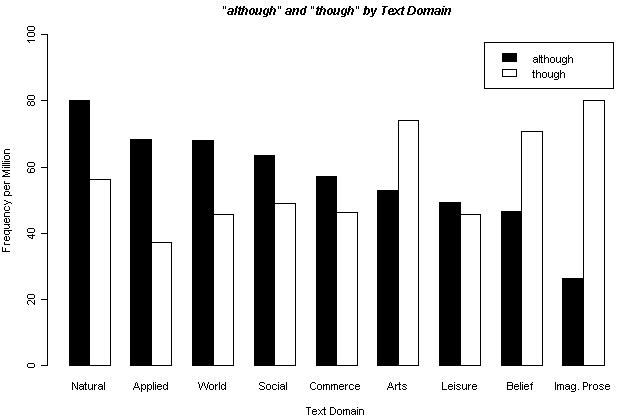 Both of these subordinators [though and although] occur in all four registers [conversation, fiction, news, and academic prose], although the registers show different preferences of use. Conversation and fiction show a slightly greater use of though (concessive clauses are, however, uncommon in conversation generally). News shows no particular preference. In academic prose, although is about three times as frequent as though. Although seems to have a slightly more formal tone to it, fitting the style of academic prose . . . . The greater use of although by writers of academic prose may also result from an attempt to distinguish this subordinator from the common use of though as a linking adverbial in conversation . . . .
・ Rayson, P., D. Berridge , and B. Francis. "Extending the Cochran Rule for the Comparison of Word Frequencies between Corpora." Le poids des mots: Proceedings of the 7th International Conference on Statistical Analysis of Textual Data (JADT 2004), Louvain-la-Neuve, Belgium, March 10-12, 2004. Ed. Purnelle G., Fairon C., and Dister A. Louvain: Presses universitaires de Louvain, 2004. 926--36. Available online at http://www.comp.lancs.ac.uk/computing/users/paul/publications/rbf04_jadt.pdf . ・ Rayson, P. and R. Garside. "Comparing Corpora Using Frequency Profiling". Proceedings of the Workshop on Comparing Corpora, Held in Conjunction with the 38th Annual Meeting of the Association for Computational Linguistics (ACL 2000), 1-8 October 2000, Hong Kong. 2000. 1--6. Available online at http://www.comp.lancs.ac.uk/computing/users/paul/phd/phd2003.pdf .